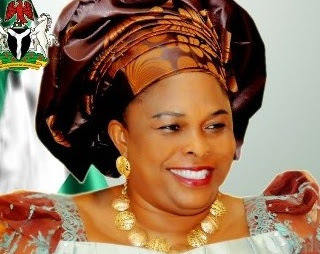 Yimiton's Blog: Patience Jonathan Appointed Permanent Secretary! This is a serious something oh! Wednesday, Patience Jonathan became the first wife of a sitting president to be appointed into the high echelon of the civil service order, while yet serving as the nation’s First Lady. She was appointed a Permanent Secretary by the Seriake Dickson-led government of Bayelsa State. The governor was elected into office last February. Yes, the concept of First Lady, which is copied from the American system, registers a strong connect in the consciousness of Nigerians, but it is an office still not known to the nation’s constitution. It remains largely a ceremonial office and not careerist. The name of the president’s wife was first on the list of 19 persons confirmed to the position in a statement by the state government Wednesday evening. The senior special assistant to the governor on media affairs, Mr. Daniel Iworiso-Markson, confirmed the appointment of Mrs. Jonathan Wednesday, saying that the governor, in doing so, only exercised his powers as enshrined in the laws of the state. Iworiso-Markson explained that the First Lady was a teacher in the state’s civil service and has been on leave of absence since 1999 when her husband became the deputy governor of the state. As if to pre-empt queries and unfair remarks that may trail the appointment, the governor’s spokesman argued that Mrs Jonathan would have risen to the status of a permanent secretary, if she did not punctuate her career growth by taking a leave of absence to join her husband in his political service, first to Bayelsa State and then to the entire nation. Mrs. Jonathan obtained the National Certificate of Education (NCE) in Mathematics/ Biology in 1989 from Rivers State College of Education and a Bachelor of Education in Biology and Psychology from the University of Port Harcourt, Rivers State, Nigeria. Dame Jonathan’s working experience include: teaching, banking, sports administration and the state civil service, before her husband became the deputy governor of Bayelsa State and years later, Bayelsa State governor’s wife, wife of the vice-president and now, wife of the president. The announcement made on the state broadcasting station, Radio Bayelsa, and signed by the Head of Service, Mrs. Gloria Izonfor, stressed that the constitutional power conferred on Dickson, in section 203 sub section 2c, Dame Jonathan and 17 others were elevated to the position of permanent secretary in the state civil service. It was not immediately known which ministry she has been posted to, albeit in absentia, or which ministry she was serving before she went on her leave of absence.